Ever wanted to discuss French auteurs with an award-winning actor? Or maybe give him a few notes on nailing a performance? Wounded everyman and Oscar nominee Paul Giamatti gives those opportunities and more to a family of cinephiles in a campaign from Arnold Worldwide with spots that will debut during the Academy Awards on Sunday. The series features his first on-camera branded commercials, as a spokesman for internet provider CenturyLink’s Prism online television service. "We had no idea if he’d say ‘yes’ to this opportunity," said David Register, EVP and Executive Creative Director at Arnold. "But after reading the scripts, Paul said it felt like they were written for him — he really liked them." Giamatti previously appeared in three 30-second spots with the same "family" that debuted in mid-January, a "soft open," as Register puts it. They question his hair and make-up and test his improvisational abilities from the comfort of their own home. As an exasperated Giamatti takes in their "recommendations," the voiceover tells viewers they can "feel like a Hollywood insider," too. "There’s this sort of terrific honest, put-upon vibe that has made him a great comedic foil, which makes him a convincing and relatable target for our family’s criticism," Register said. "On the other hand, Paul is an incredible, Golden Globe and Emmy Award-winning actor. I mean, how can you school Paul Giamatti?" The market is saturated with broadband providers, cable alternatives and video streaming services, so Arnold needed to create something that would stand out. The "Hollywood Insider" theme led them to eschew the Super Bowl and focus on an Oscar debut. "We knew we wanted to do a push around the Oscars, as the world’s most Hollywood-focused event," Register said. 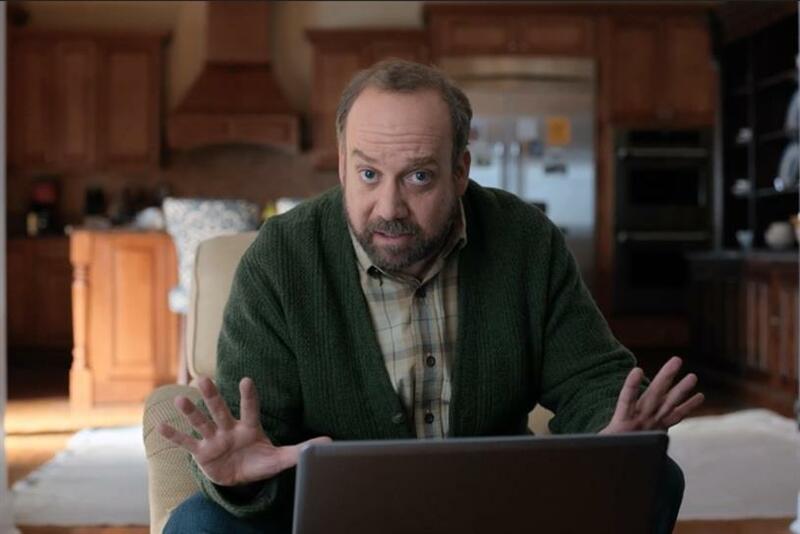 The set of four ads featuring Giamatti and the Johnson family (the spot that debuts during the Oscars has 30- and 60-second versions) offers thorough insight into their rapport, both with the distinguished actor they seem to have on-call and with each other. Dad has heavy respect for the director’s chair and drills Giamatti on multiple occasions. Mom has acting chops and the highest standards for Giamatti’s delivery. Older Brother has the smug skepticism of someone who’s watched the IMDb Top 250 (and rearranged them to his liking), while Younger Sister is a budding prodigy. "They were thrilled to work with him," Register said. "They actually all got along like a family. Paul is such a humble guy -- he never took on the persona of being this huge star around the family, when we weren’t filming." The Johnsons also appear in four 15-second videos without Giamatti that offer brief pointers of interest to Oscars watchers, like "How to Name Drop in Hollywood" and "Avoiding Notes." The spots will run on social media platforms beginning Sunday. Interest and reception has been good enough even before the Oscars spots aired that Arnold is planning to continue the campaign, with more ads to come featuring both Giamatti and the family members.